Hanoi authorities on March 16 held a meeting to seek measures to help farmers boost sales of daikon radishes which are facing incredibly low prices. Vu Van Ky, head of Dong Cao Co-operative in Trang Viet Commune, Me Linh District, said that the locality is home to 80 hectares of radishes. Among those, 20 hectares are ready to harvest with 1,500 tonnes which need to be consumed in the next 10-15 days. After Tet Holiday, radish prices have dropped sharply due to the slow sales to around VND1,500-2,000 (6.5-8.6 US cents) per kilo. Hoang Thi Sang in Dong Cao Village said that it costs roughly VND3 million (USD136.3) for every 360 square metres of radish. The price drop has caused big losses for local farmers which are estimated at VND2.5 million (USD113.6) for the same area. Lots of farmers in Dong Cao Village have to pull out the radishes in order to plant other vegetables. The radishes have been abandoned on the roadside or thrown into the Red River. Farmers in Trang Viet Commune have been estimated to lose around VND2 billion (USD91,000) in total for the slow radish consumption. According to Ky, the favourable weather meant a big harvest. Many farmers wanted to wait after Tet to sell, expecting to have higher prices. However, the time after Tet is also a period when there are a wider variety of vegetables. At the meeting, representatives from businesses which buy and distribute farm produce said that the situation would have been better if the slow radish sales had been reported to them earlier. They pledged to help buy the radish for farmers with better prices sold in the market now. 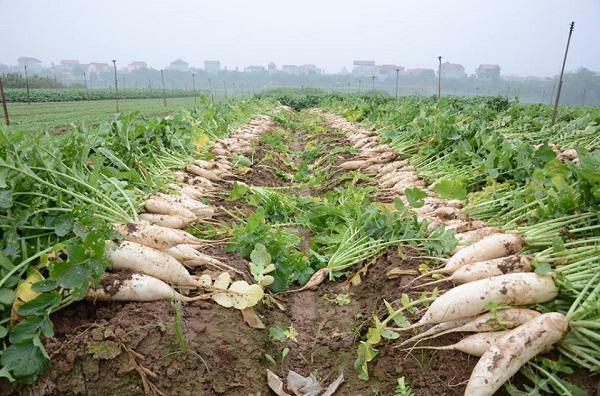 Tran Thi Phuong Lan, Deputy Director of Hanoi Department of Industry and Trade, said that the department will launch a programme to boost radish distribution by calling on agencies, enterprises as well as people to help buy the radishes. 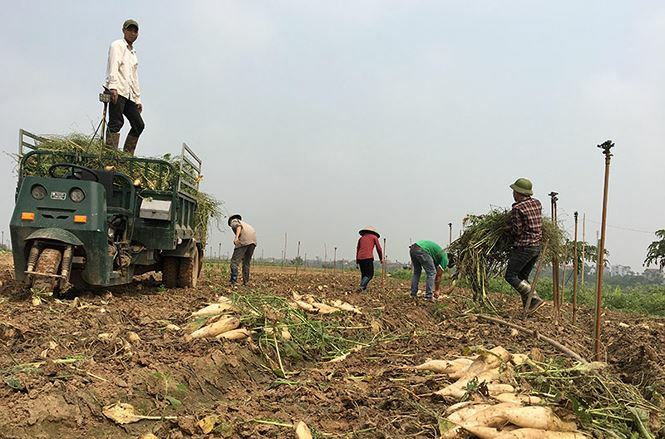 The department has also contacted Hanoi Confectionery JS Company and Trang An Confectionery JS Company to help dry the radishes free of charge. Hanoi Confectionery JS Company can dry two tonnes of radishes per day, while Trang An can deal with 10-20 tonnes. "The radishes which can’t be sold need to be dried to avoid being thrown away,” Lan noted. In the long term, it is important for the commune to consider turning into other kinds of crop besides radishes to meet the diversified market demand.​/.